Donate solar eclipse viewers to Africa! Every donated pair of eclipse glasses WILL reach a student for use for the eclipse. Donate on the Astronomers Without Borders website directly by clicking on the link above. On 3 November 2013, many countries in Africa will experience a total solar eclipse. This is a unique cosmic event, as well as a lifetime opportunity to talk/walk science, technology and related in/for Africa. Various continent-wide initiatives are taking shape to consolidate the Pan-African intention to make this eclipse, a fun and unique intra-african as well as international collaboration. The following countries are in the path of totality and will be experiencing a 100% obscuration of the Sun: Gabon, Congo-Brazzaville, Congo-DRC, Uganda, Kenya and Ethiopia. Many more will experience a near-total or partial eclipse (nearly the entire continent). 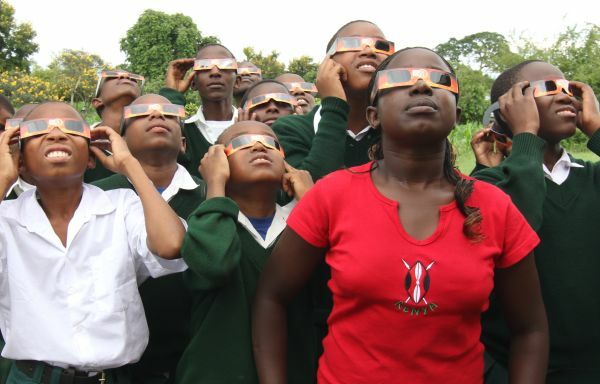 A new Astronomers Without Borders program will provide thousands of free eclipse viewing glasses to schools across Africa where a solar eclipse will take place on 3 November. This is a rare opportunity to expose students to science in a region where science resources are often non-existent. Anyone can purchase safe eclipse viewing glasses, in any amount, for donation to African schools. The need is great. The International Astronomical Union’s Office of Astronomy for Development is providing support to the project. Schools have been identified and vetted by partner organizations in each country, and distribution networks have been verified. 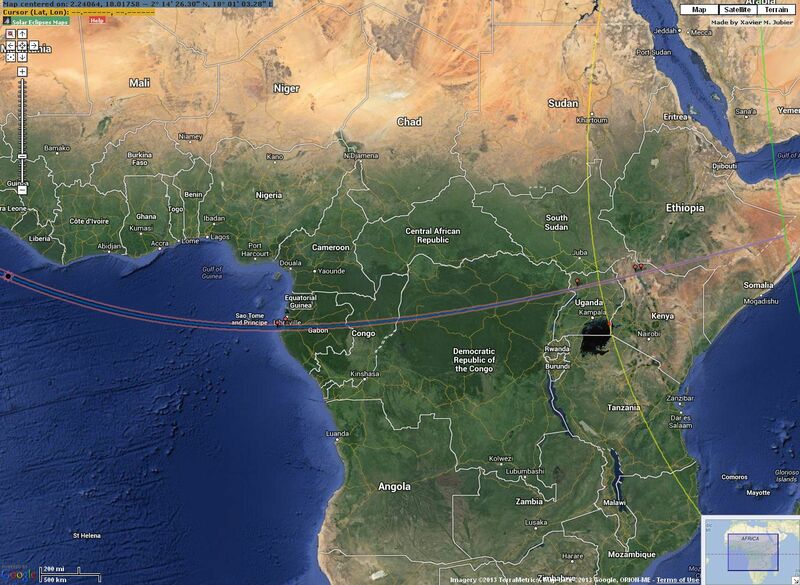 Click on the map for a full display of the eclipse path across Africa.